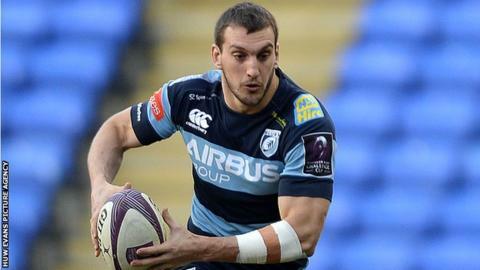 Cardiff Blues director of rugby Mark Hammett says Wales captain Sam Warburton did not suffer any serious injury in the 22-13 loss to Leinster. The open-side flanker left the field in the 12th minute after suffering a blow to the face and did not return. Hammett confirmed Warburton would not feature in next week's European match with Rovigo, but it should not affect his Six Nations involvement for Wales. "He got a cut to the eye but I don't think it's severe," Hammett said. "I've just spoken to him, he's driving home, so in terms of that side of it I think he's pretty good. "I think it's one of those ones that's stitches below the eye... that made it a wee bit more difficult. "But from a time frame it's probably just a matter of how quickly that heals. "I was looking at giving him the week off against Rovigo anyway, so hopefully that will give him time to heal." Blues had fought back to lead Leinster 13-5 in the Pro12 encounter after shipping an early try to the visitors. But the sending off of lock Jarrad Hoeata after 32 minutes for a high tackle on Rob Kearney, and a subsequent sin-binning for Manoa Vosawai proved turning points. "There's no doubt that red cards and yellow cards do cost you," Hammett said. "Where it cost us was we continued to play and played probably the best brand of rugby so far... but when you turn ball over - and you do turn ball over in rugby games - turnovers when you're down on numbers is just danger time. "Unfortunately we did that and they ended up scoring a couple of quick tries, often against the run of play."